The No. 10 seed Premier Baseball Club jumped out to an early lead and never let it go in a 6-3 win over No. 4 Kings-Martinez in the 14u championship game at the Triple Crown Arizona Spring Championships. After a long day of play for both sides, the difference in Sunday night’s championship matchup wasn’t the offense -- it was Premier’s polished defense, heads-up baserunning and solid pitching. Both sides had six hits each, but Premier’s rally-squashing defense kept the Kings off the scoreboard. The first instance came in the first inning, when a pair of walks put the first two Kings batters on base. A double steal attempt on a pitch in the dirt found the lead runner caught in a rundown. The next two batters went down in order. The rally-killer of the fourth inning was a textbook 6-4-3 double play on a hit-and-run attempt, with Premier shortstop Dawson Santana flipping to second just in time for the turn. The fifth inning saw Kings do damage with two outs and put their first two runs on the board. When Mason Krahn tried to steal second, Premier catcher Trevin Long launched a throw down to nab the runner and end the inning. The game ended on a play nearly identical to the one in the fourth inning. Another 6-4-3 double play, executed perfectly, took Kings-Martinez (San Antonio, TX) from a one-out, two-on situation to the end of the contest. It wasn’t only defense that kept the momentum in Premier’s favor. Strong pitching was just as important to the team’s success. 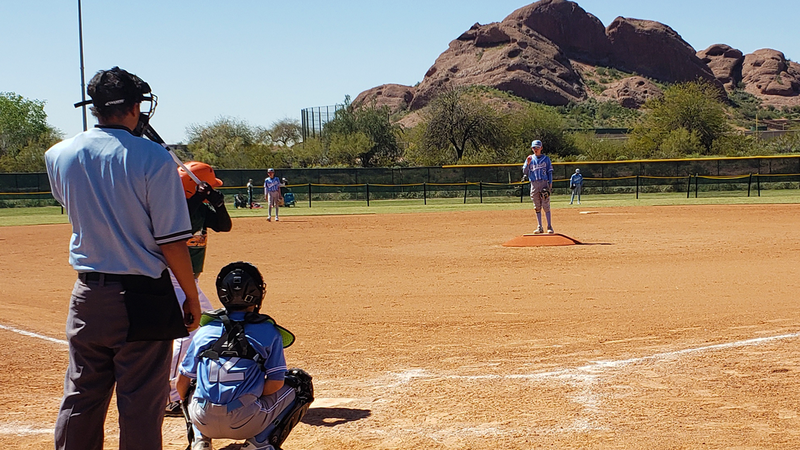 After four tiring games in the Arizona sun, Premier got consistency and stamina on the mound in the form of a six-inning, 94-pitch outing by Andrew Peru. Peru pitched out of some tough situations. In a sixth inning where a run had already scored, he stopped the bleeding and escaped a bases-loaded jam by inducing a bouncing grounder to second base. In the second inning, a loud Kings bench might have fazed someone else. Instead, Peru could be seen grinning as the opposition responded to his pitches. He finished the inning with a strikeout. “My arm slot was in the right spot. The mound was perfect for my type of pitching,” Peru said. On the offensive side, alert baserunning was the key to Premier’s success. After drawing a walk and advancing on a groundout, Santana forced an errant throw from Adrian Herrera while trying to steal third, coming home for the team’s first run as the ball flew into the outfield. Santana’s second trip to the plate was nearly identical to his first, though this time he tagged up from third to score on a Peru sac fly. “We work on baserunning a lot. Inside, outside, whenever we have the time,” Jayden Ripplemeyer said. Ripplemeyer had a stolen base of his own, along with throwing the final frame of the game for Premier. Over seven innings, Premier took five extra bases on stolen base attempts and wild pitches. Any day with four games is a whirlwind, but the final two contests were especially so for Premier. Immediately after finishing their semifinal, they walked across the pathway to the championship field to begin preparing. In addition to the marathon approach, all four victims Premier’s bracket run were higher seeds - Nos. 7, 2, 6 and 4. The players never felt that they couldn’t get the job done or the odds were stacked against them. 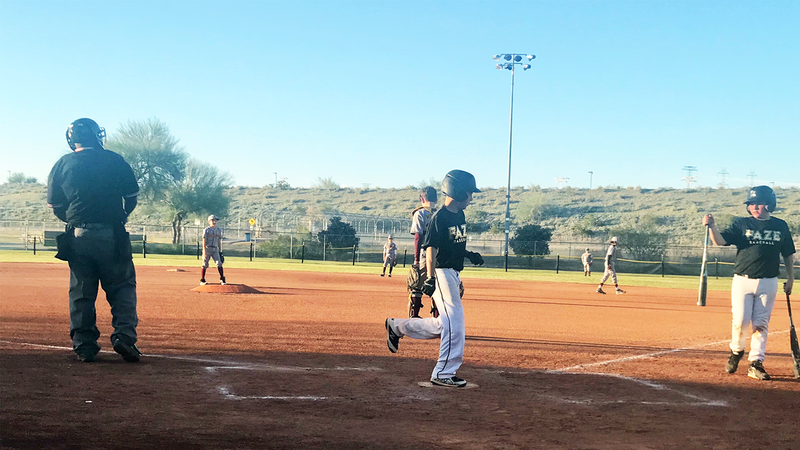 A pair of big innings sent the 12uD2 Dirt Dogs to a 15-2 win over Power Alley Bockelmann in the teams’ final game of pool play Saturday at the Triple Crown Arizona Spring Championships. Power Alley opened the scoring in the top of the first, but the rest was all Dirt Dogs, who notched five runs in the first and eight more in the third to secure a loud victory headed into Sunday's championship bracket. The Dirt Dogs (Calimesa, CA) put on a master class in small ball and heads-up baserunning in the first inning. The first seven hitters got on base, with a string of five straight hits leading off the bottom half of the inning. The other two Dirt Dog runners reached first on errant throws. They took four extra bases on wild pitches during stolen base attempts and picked up their first run on a balk by Power Alley starting pitcher Max Meza. The Dirt Dogs seemed very fresh for a team that had played a noon game immediately before the contest with Power Alley (Greeley, CO). Not only were they alert on the basepaths, but on defense as well. A pair of nifty double plays ended the first two frames just as Power Alley seemed to have a rally brewing. The first came with runners on first and second. A grounder to short turned into a 6-4-5 double play with a force out at second and a heads-up tag on a runner trying to advance to third. The second began with a short bunt placed between Dirt Dogs starter Evan Heaton and catcher Daniel Rodriguez. It was a similar force-and-tag situation, this time involving a throw from Heaton to first base and a laser to home, where Rodriguez tagged the runner attempting to score. After the Dirt Dogs’ high-scoring first inning, Power Alley’s Meza seemed to stifle their bats with a 1-2-3 second. The Dirt Dogs answered in kind when Trevor Busby took the mound in the top of the third inning and struck out the side on 13 pitches, featuring a sharp fastball and sweeping breaking ball. The fourth inning also featured a strong Dirt Dog pitcher, when Trent Gordon collected two strikeouts, allowed one single and ended the game on a grounder to second base. “They hadn’t pitched yet, so we wanted to get them each an inning before we head into bracket. They’re our two best pitchers,” Heaton said. Sandwiched between those two pitching performances was a monster half-inning where the Dirt Dogs batted around and flaunted their power stroke. The bottom of the third included 10 runs and nine hits, with two ground rule doubles and two home runs from lefties Busby and Jack Clark. “Our approach for the whole team is just to hit the ball and make contact,” Gordon said. It was Busby’s third home run in as many games at the Spring Championships, and he knew his pitch when he saw it. “It was my favorite pitch, the fastball right down the middle,” Busby said. The Dirt Dogs will look to carry Saturday’s strong performance into Sunday, having finished 2-1-0 in a tough pool. Making the statement they did in their final pool game boosts the team’s confidence headed into the bracket, where they are the No. 12 seed of 16. The Arizona Spring Championships wrapped up pool play on Saturday, and in the 11uD2 mix was Northmen (UT) and CBA Sacramento Titans. These squads were evenly matched, and the final score is proof. But it was the Northmen who walked away with the 13-12 victory and earned their second win of the tournament. Northmen head coach Clayne Garrett said it was his northern Utah teams’ third time playing outside this year, but witnessing their strength with the sticks, you couldn’t tell. The Northmen finished with 13 hits as a team, including seven doubles. The team was consistent, too, scoring multiple runs in every inning. Those indoor BP sessions paid off Saturday, especially for coach’s son Grady Garrett. Grady went 2-for-3 at the dish with two RBI. Grady’s stellar outing was matched by his teammates. Easton Pratt, Brodie Deal, and Crew Denning all had two hits. The defensive struggles coach Garrett mentioned referred to the four Northmen pitchers combining for 10 walks and giving up seven hits. The defense also had a few errors. Despite all of this, Luke Penland took the mound with poise in the fifth and final inning with a one out, bases loaded situation. Penland was able to turn this pressure situation into a positive outcome. He got a fly ball for out number two and clinched the save by striking out the Titans cleanup hitter, who launched a home run in his previous at-bat. On top of Penland’s pitching performance, he also went 2-for-3 with an RBI. 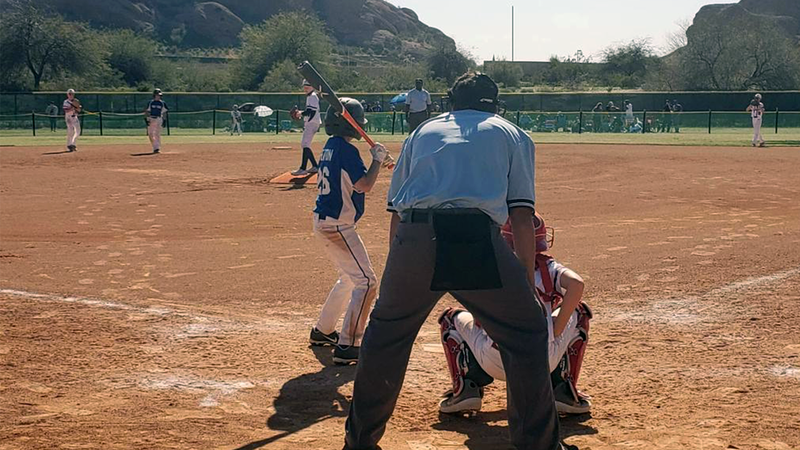 The 12uD2 NorCal Prospects slugged their way to a 14-1 rout of the Cascade Crush in their final game of pool play Saturday at the Triple Crown Arizona Spring Championships. The Prospects came out strong in the top of the first, leading off with four straight hits. Three of the seven runners who reached base would come around to score, giving NorCal a lead that grew every inning. In four frames against the Crush, NorCal hitters were 14-for-25 with two doubles and a five home runs. “We work on hitting a lot. We have a lot of cage time,” NorCal head coach Matt Crudale said. “We take a lot of pride in being able to drive the ball and have good at-bats." They had no trouble driving the ball in Saturday’s game. Of their five home runs, three were to the opposite field. Lefty Jack Karst’s three-run blast cleared the fence in straightaway center. The bulk of those homers came in the final inning, when Karst, Jackson Chen and Matthew Baur all but decided the game by adding five runs the Prospects’ lead. “I was just aggressive. We’re trying to hit the ball and make contact,” Baur said. Baur was a big part of NorCal’s offensive success in the game, going 3-for-3 with a double to go along with his solo shot. The game was a much-needed win for the Prospects (Danville, CA), who finished a back-and-forth game against the Colorado Select with a tie just moments before first pitch. A doubleheader in the dry, hot desert can be tough for even adults. Crudale and the Prospects were conscious of conserving arms for the bracket run ahead. That resulted in three pitchers combining to throw four frames for NorCal, though they were all extremely effective in limiting offense. NorCal’s starter, Lucas Glazier, allowed just two baserunners over two innings, striking out three. Glazier saved what could’ve been a potential rally for Cascade in the second inning. Following a hit batter and two consecutive wild pitches, Glazier faced a 2-0 count with a runner on third and two outs. He battled back to strike out Diego Gutierrez swining and end the threat. Rhett Thompson and Dylan Waters combined with an inning each to finish out the game and hold NorCal’s lead. The only run from the Crush (Bellingham, WA) came in the bottom of the fourth inning, when Waters gave up a solo shot to Grady Adams, who had thrown all four of Cascade’s innings and was well over 100 pitches. All in all, NorCal pitching limited Cascade to just three hits. Though their Pool C opponent Blackhawks have locked up the top seed in the pool with an undefeated performance, the Prospects have put themselves in a position to pull a great seed headed into the bracket. Ultimately, the Prospects ended up with the No. 7 seed out of 16 for the championship bracket. 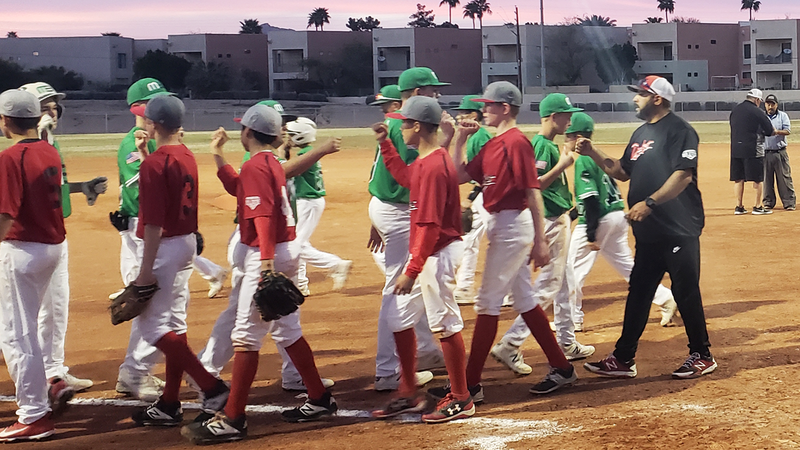 In an offense-heavy affair in 13u Division 1, the West Covina Dukes (CA) picked up a 10-6 win over the Midland Bandits on Friday night at the Triple Crown Arizona Spring Championships. The four-inning game saw 48 plate appearances and 20 hits between the two teams to go with the 16 total runs scored in their first pool play game of the event. Though there were some loud hits, it was a combination of small ball and slugging that proved effective for the Dukes. They had nearly as many bunts in play (three) as they did extra-base hits (four). That bunt single in the third, placed perfectly by Ryan McNamara, moved runner Garret Dykstra over to third base who would score on the next play. McNamara would also find home plate in the inning. The other two bunts were laid down in the first inning in consecutive plate appearances. The first, from Charlie Vasquez, drew an errant throw from pitcher Nick Ellis, moving runner Troy Estrada into scoring position. The second, from Dykstra, moved Estrada to third. A groundout from McNamara allowed the runner to score from third. That single run in the first put West Covina ahead of Midland (TX). The Dukes never fell behind in the contest. Instead, they put together two doubles, two triples and strings of hard singles to score nine more runs in the final three frames. One of the loudest hits of the night came off the bat of Mike Villagran, who was 2-for-2 with a single, triple and a sacrifice fly. He connected on the two-strike triple to lead off the second inning and start the Dukes’ scoring. Villagran showcased an ability to drive in the runner with his fourth-inning, opposite field sac fly, the final run of the game. Colin Olsen also delivered a great performance at the plate, picking up a pair of singles and driving in two runs. The Dukes’ starting pitcher, Olsen’s final line of six runs allowed over 2.1 innings doesn’t tell the full story. Before a monster third inning from the Bandits that would bring the game’s only tie since the start, Olsen had cruised through two innings, giving up just two hits and a walk while striking out three. After Olsen was pulled in the third, Caleb Nguyen took the mound for West Covina. The first three Bandits reached, but the inning ended on a pickoff at third and a strikeout. Nguyen found his groove at the end of that third inning. Returning for the fourth, he struck out the first two he faced and induced a weak grounder back to himself for the final out. It was the only one-two-three inning of the game. The Dukes made quite a statement, given a weather-driven slow start to the year. Rain-soaked California has put what would normally be a team in its 12th or 13th game of the year at just six so far this season. Still, after winning a tournament last weekend, the Dukes are hungry to make a statement. Their offensive outburst was a good start. 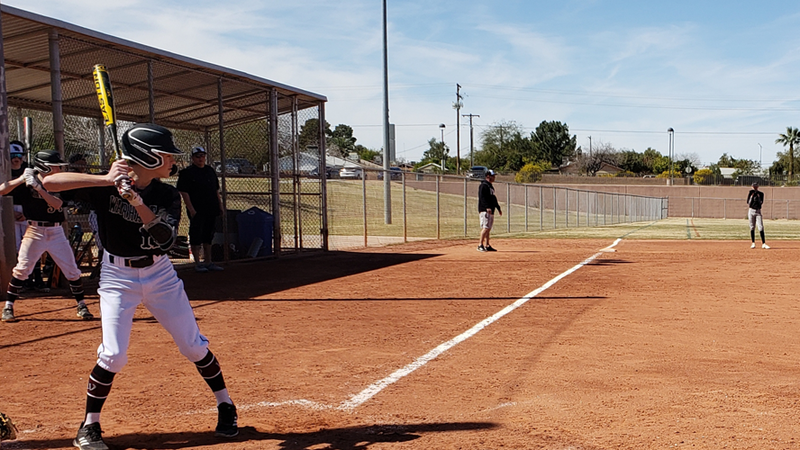 The 13u Warhawks Baseball-Dodson squad brought some of the Colorado chill with them Friday to the desert as they cooled the bats of VCBA for a 2-0 win in their first game of pool play during the Triple Crown Arizona Spring Championships. The victory was powered by two strong showings from Warhawk pitchers Brock Lansville and Jack Perotti, who combined to limit VCBA (Thousand Oaks, CA) to two hits. Lansville and Perotti, throwing three and four innings respectively, were at their best with runners in scoring position. VCBA batters were 0-for-12 with nine strikeouts and three walks in those chances. “That’s a point of emphasis for us. You’re always one pitch away from getting yourself in a situation where you’re going to have to bear down,” Dodson said. The first situation came early, in the top of the first inning. VCBA’s Cade Falsken connected for a loud a leadoff triple, followed by a walk and stolen base by Michael Moran to put two runners in scoring position with no outs. Lansville responded by striking out the next two batters and inducing a short popup to second base. A similar situation came in the final inning, when a hit batter, flyout to right field and single to center put Perotti in a tough spot on the mound. He worked back to strike out the final two batters of the game, the final pitch a full, sweeping breaking ball that induced an empty swing. Perotti said there’s no change in his approach when the pressure is on. “My dad always taught me, no matter what happens, just throw,” he said. Though Perotti had already thrown three innings before taking the mound again in the seventh, the coaching staff didn’t hesitate to give him the ball again. In addition to their poised performances on the mound, Lansville and Perotti drove in both of the Warhawks’ runs in the contest. Perotti delivered in the first with a deep triple to give the Warhawks the lead. Lansville added a late insurance run in the bottom of the sixth with a single. “I was just trying to do my job and at least move the runner into scoring position,” Perotti said. Both runs were scored by William Garduno, who finished the day with a triple, two walks and two stolen bases. His stolen bases were responsible for moving him into scoring position before the big hits from Perotti and Lansville. Speed on the basepaths is an asset Garduno tries to use to the fullest. “When I get on base, I try to set my team up to score,” he said. Though clutch hits and strong pitching took the spotlight in today’s game, a strong defensive effort from the Warhawks’ Macoy Terry saved what would have easily been a game-tying hit in the third. With runners on the corners, Terry quickly gloved a line shot to first, stepping on the bag for the unassisted double play and keeping the shutout intact. Perhaps most impressive is that the Warhawks delivered the strong all-around performance on little rest. Most of the team was delayed due to the inclement weather in Colorado. This was also just the second weekend of the year that the team was able to compete outside, which can always have an impact with preparation. “We’ve been stuck in cages. To get out here and compete like they did, you can tell they’re hungry,” Dodson said. Despite the fatigue and lack of outdoor playing time, the Warhawks didn’t seem fazed when all was said and done. Dodson is right – the hunger shows. 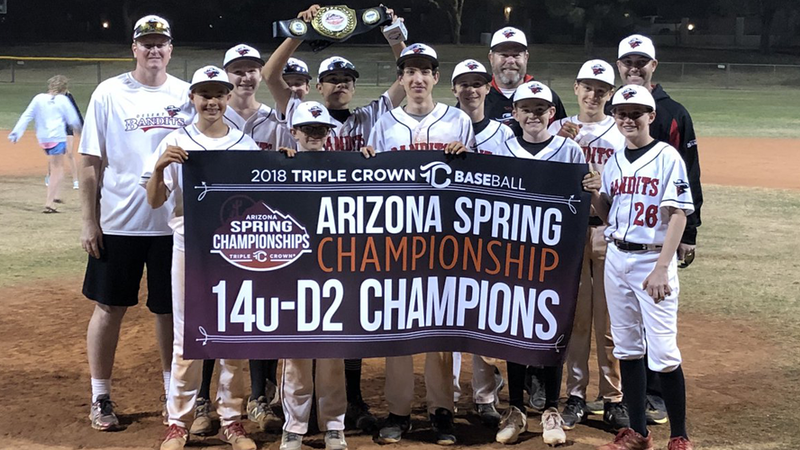 For more than 15 years, Triple Crown Baseball has laid the groundwork and opened the doors for youth baseball programs to launch the season with a purpose, and with a sense of perspective. 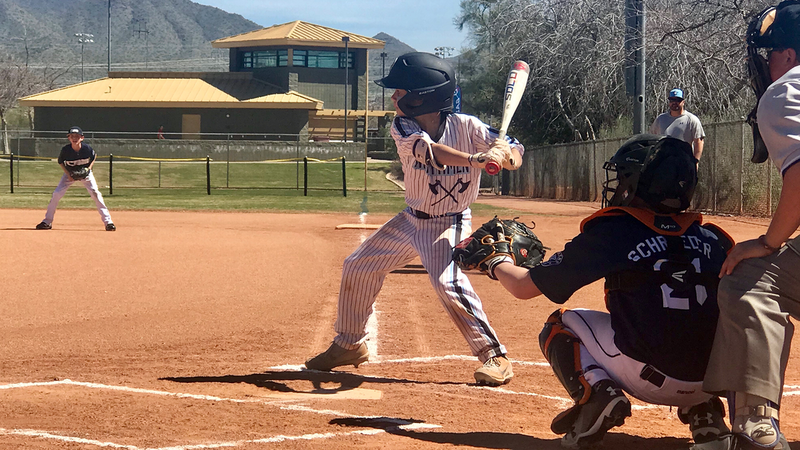 The 2019 Arizona Spring Championships, held over two sessions (March 7-10 and 14-17) in greater Phoenix, flexes a lot of muscle on the tournament calendar by offering competitive brackets while giving teams and families a vacation-friendly setting when away from the fields. The tournament will feature 280 teams overall (up 30 from last year), from 12 states, the District of Columbia and Mexico; logically, the western half of the country is all in, but the event also welcomes teams from Wisconsin, Iowa, Oklahoma, Texas and Kansas. The event format includes the Cactus Bracket, which gives teams two extra games and adds enormous value to teams that are trying out players in new positions, or maybe exploring options for the pitching staff. The Arizona Spring Championships help take away some of mystery and unknowns within each roster. 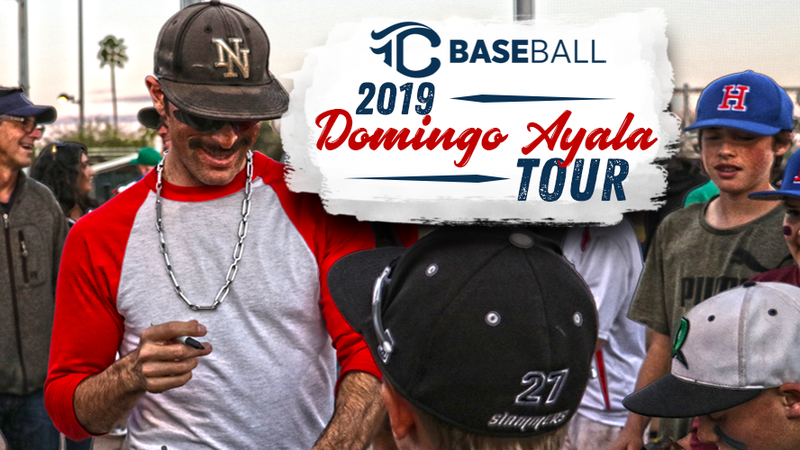 Session 2 will feature an appearance from noted YouTube personality Domingo Ayala; his show will start at 6 p.m. Saturday, March 16 at Chaparral Park, 5401 N. Hayden Road, Scottsdale, AZ. While Phoenix has no shortage of places to explore, the balance of the youth teams coming to town make a point to check out MLB Spring Training games – there are 15 MLB franchises that work out the winter kinks in the Cactus League, playing within a radius of 50 miles of each other. There’s always a good fit if you’re looking to catch a game. 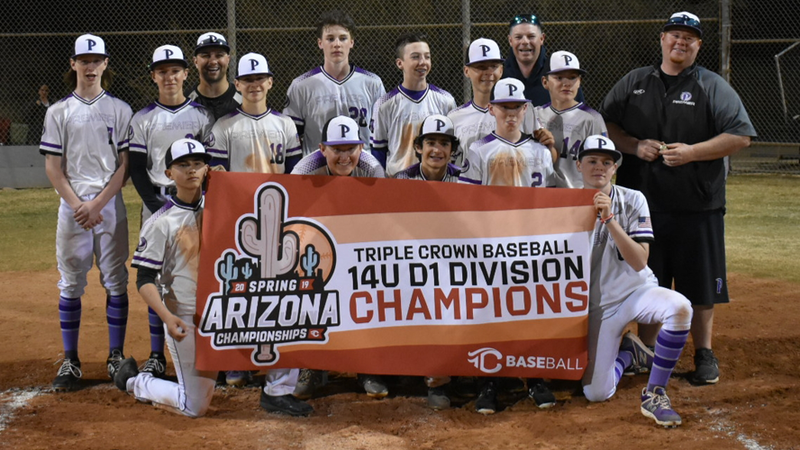 One of the common refrains you hear from teams making their way to the Triple Crown Arizona Spring Championships is just how lucky everyone feels to be heading to the desert while winter’s chill is making summer seem like a million miles away. MLB SPRING TRAINING – If you’re playing baseball, chances are you’re a fan of the big leagues as well. Coming to Arizona in March offers the opportunity to see the MLB in a fresh light – young prospects looking to make an impact, and veteran players working out the kinks in an up-close-and-personal setting, almost nothing like you’ll experience in the regular season. The Cactus League features 15 MLB teams in a tight radius in greater Phoenix. DESERT BOTANICAL GARDEN – Thousands of plant species and a riotous variety of color and texture make the Garden a rewarding destination; it’s always amazing to consider the mix of plants, flowers, trees and cacti that are natural, native inhabitants of Arizona. SCOTTSDALE – If the mood strikes for a little culture, head to this northern suburb. The restaurants, shopping and art galleries are defined by the finer touches in appearance and style, offering a full-on break from the ballpark experience. GOLF – If you love to play, your time in and around Phoenix puts you on the doorstep of hundreds of courses, suitable for beginners through experts. Should you get enough time away from the ballpark, tee it up, especially because the weather is ideal – this diversion is a lot more of a challenge in summertime. SUPERSTITION MOUNTAINS – On the east side of the metro area sits the jagged, jaw-dropping beauty of the Superstition Mountains, home of numerous hiking trails that can be as challenging as you desire. Again, tackle these powerfully gorgeous vistas in springtime, when conditions make it a pleasurable journey.